Blood Brothers tours the UK 2012-13, is this the show’s last hurrah? Blood Brothers may have said a final farewell to London’s West End after a whopping 24 years in performance, but Mrs Johnstone and the twins will be touring the UK until spring 2013. Check out the tour dates below to see if the magic of Blood Brothers is coming to a town and theatre near you. Tori Hargreaves, Graeme Kinniburgh, Jonathan Vickers, Karl Greenwood, Marc Mulcahey and Suzi Power. Want to know more about the actors playing the lead roles of Mrs Johnstone and The Narrator in the Blood Brothers tour? Check out their backgrounds and performance history below. Marti Pellow rose to fame in the 1980’s in the Scottish boy-band Wet Wet Wet. After beating a heroine addiction, Pellow dabbles in musical theatre, landing roles on both the West End and Broadway as Billy Flynn in Chicago as well as starring in the London revival of The Witches of Eastwick (2008-2009.) 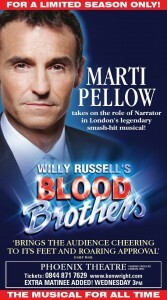 Marti Pellow has starred in the UK tour of Blood Brothers in 2011 and went on to reprise the role on the West Endfrom 1st November 2011 – 28th April 2012. Pellow is now back in the tour cast and will play his role as the Narrator throughout the run. Niki Evans reprises her role as Mrs Johnstone in the Blood Brothers UK Tour. 39-year-old Niki teetered around the edge of the public eye for years before making it to the live finals of X Factor in 2007. Off the back of her success, Niki successfully auditioned for Blood Brothers and made her West End debut in the show at the Phoenix Theatre in November 2008. Evans briefly left the cast twice, only to reprise her role in 2009 and again in 2010. Niki Evans also fulfilled the role of Paulette in the UK tour of Legally Blonde in 2012, before once again returning to Blood Brothers, only this time for the tour. Do you think the tour will be as good as the West End production? Leave your comments below! I saw Marti Pellow as the Narrator at the Phoenix Theatre in London earlier this year and he was amazing. I don’t know about Niki Evans..I remember her from X Factor…anyone know if she can actually act?! Niki Evans is amazing in this production!! I’ve seen it several times and seen her in the Pheonix Theatre London. The best leading lady in it yet. I have had my tickets for Cardiff for 2 months because of this. Marti was, of course, absolutely outstanding, the best narrator i’ve seen, i love his dark acting & of course his superb voice. Very sad to see it finish in London – what will i do now without my bi-annual or annual fix? Fingers crossed for a film/dvd. yep i feel the same maybe a film would be very good and a dvd too ! yes i saw her in this production in my home town and she can act ! I saw this show earlier in the year in Glasgow, it was one of the best shows I have ever seen. The acting was fantastic it left me shaking at the end. Would love to see it back in Glasgow again. Saw another article today that Marti Pello has not agreed to do some of these shows yet. Come to Kent! Preferably Canterbury or Theatre Royal Margate. Please! First time I’d seen show and it is fantastic. Loved every minute, so moving. Everyone was brilliant! Have seen show twicebut Nikki was the best. We booked to see the show in London before it closed, but the trip was cancelled by the coach company. Marti Pellow is amazing in this role, superb voice and incredibly foreboding. Maureen Nolan was superb as Mrs J, and Niki Evans a close 2nd. High praise has to go to Sean Jones for the amazing transition from boy to teenager to troubled man. All in all a wonderful show…miss it, miss out! Fantastic show in Cheltenham. Maureen Nolan was superb, her voice was amazing and she showed immense passion throughout – thouroughly enjoyed it and would recommend this show. Have just seen the show for the 3rd. time, just love everything about it. Extra bonus this time as I am a fan of Marti Pellow. The entire cast / crew made the whole experience fantastic . 10 out of 10. I HAVE SEEN BLOOD BROTHERS 14 TIMES, IT’S NEVER LOST IT’S ORIGINALITY FOR ME. I GET VERY EXCITED AT THE THOUGHT OF SEEING IT AGAIN, THIS TIME WITH MY HUSBAND. THIS WILL BE THE FIRST TIME MY HUSBAND HAS SEEN THE SHOW, SO CAN’T WAIT FOR HIS REACTION. I’VE SEEN A NUMBER OF ACTORS & ACTRESSES OVER THE YEARS & HAVE NEVER BEEN DISAPPOINTED, FROM STEPHANNIE LAWRENCE TO DAVID SOUL. BOTH WERE FANTASTIC !! PATRICIA BUTLER. What a sensational show this evening. Thanks to all the cast for great performances. Hope the injury to the first Mickey isn’t too bad. A great performance especially by Paula Tappenden as Mrs Johnstone – probably the best stage performance I’ve seen anywhere. What a sensational voice! There was only one Mrs Johnston and that was Stephanie Lawrence, nobody has ever been as good as she was. I really enjoyed it beacuse it was very good it made me laugh and lots of my friends cried. My favourite part was when mickey was a little boy.I liked it when he pretended to ride his horse and when he played cowboys and indains.It was good when he first started to play with edward. I saw blood brothers at the Marina Theatre, Lowestoft, and it was simply amazing. The wonderful cast did a magnificent job in bringing me to tears – although I must add there are some extremely funny parts as well as sad. many congratulations to all involved, not forgetting the brilliant musicians. thank you. As I write this, May 2013, I have seen the current touring company on three occasions. Currently starring Maureen Nolan and Warwick Evans with Sean Jones as Mickey, I cannot see a better production than this. I’m looking forward to seeing the show again. Saw Blood brothers for the 3rd time in Leeds last night. Sean Jones as Mickey was super. Different narrator Warwick Evans. Different Edward, but we loved him, the best we have seen but cant remember his name, and we did not buy a programme ! Preferred Nicki Evans to Maureen Nolan.